WpBean is bringing you one of the best education WordPress theme for you. So, why you should use this specific LMS theme for a website? Well, there’s an obvious reason behind this theme. Before you start using XooTheme’s Education Theme, let’s see how it’s going to be helpful for you. You might be the owner of a school, college, University or extra-curricular course Institute. You just need a relevant theme for your site. Education WordPress theme is the perfect choice for you. However, there are so many education-based themes are there. But you should only choose the one that suits you and has everything you need. XooTheme’s WP Education is a well-crafted, nicely designed and easily customizable WordPress theme for anyone who wants to build an education-based website. The theme is 100% responsive and comes with flexible options. This LMS theme has everything one can expect from their educational site. The theme is powered by LearnPress plugin. There are a few advantageous options to create a free/paid course, lessons, questions, quizzes and much more. The amazing LearnPress plugin allows you to use so many free and premium features to make your usability much more awesome. This is a perfect learning management system theme you can ask for. The theme has the WooCommerce plugin support that allows you to sell your course, lessons, and eBooks online. WooCommerce integration is one of the fantastic features you can have. You’ll be able to earn or let other people earn or buy the necessary courses and lessons through your site. The event calendar is an important part of this theme. As an admin or a site moderator, you can set an event calendar right from your website. Let the audience know about any specific event you are going to arrange. 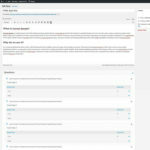 WP Education is a translation ready theme. It allows you to use multiple languages for different people around the world. If you target to create a worldwide audience panel then this can be very helpful. 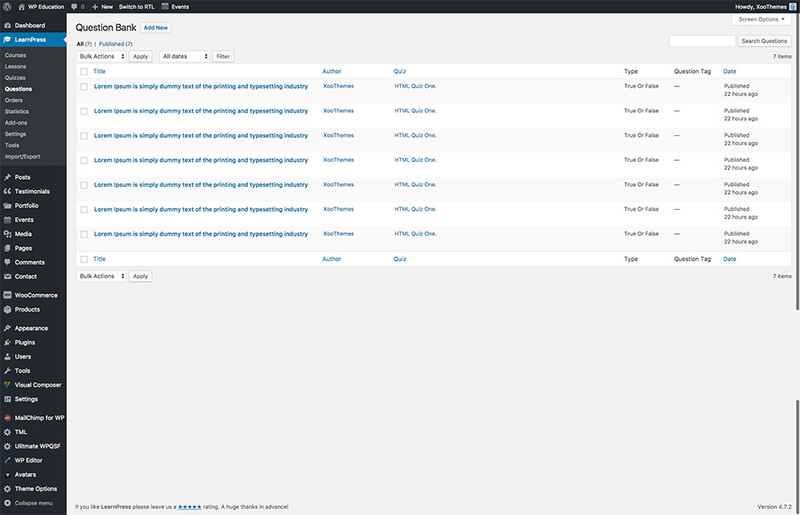 As you can see that the LMS plugin is really very helpful to make your educational site management much more flexible. 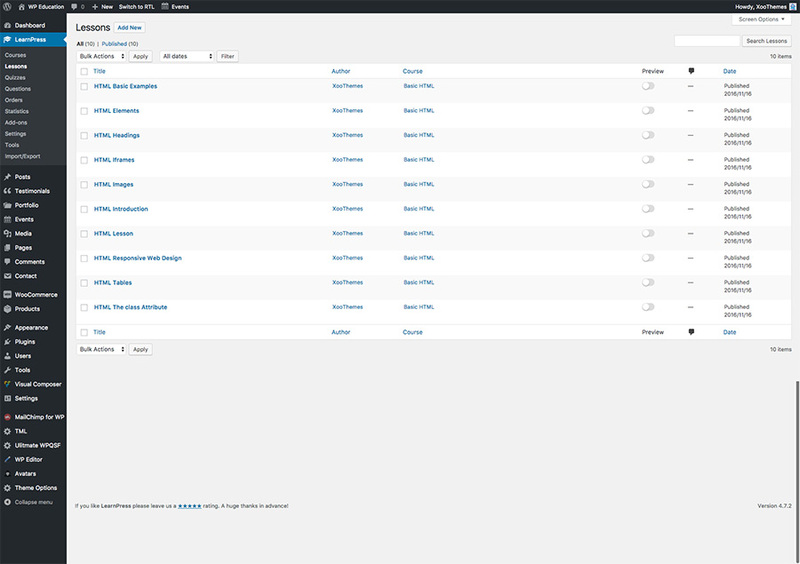 These are the extensions of the LMS plugin. To show all the LMS elements perfectly, there are well-organized shortcodes. Widgets play a very important role in a website. There’re tons of widgets one can use according to the necessities. There are multiple widget areas in WP Education. You can add custom widgets. The w3 valid code allows the entire theme works just fine and simple. It’s the reason one can use a theme without any harassment and obstacles. The well-commented code is the key block of a theme. WooCommerce plugin is a renowned plugin for those who always wanted to raise a healthy business through online. WP Education allows its user to sell courses, lessons, quizzes, questions, eBooks and various types of education-based product. 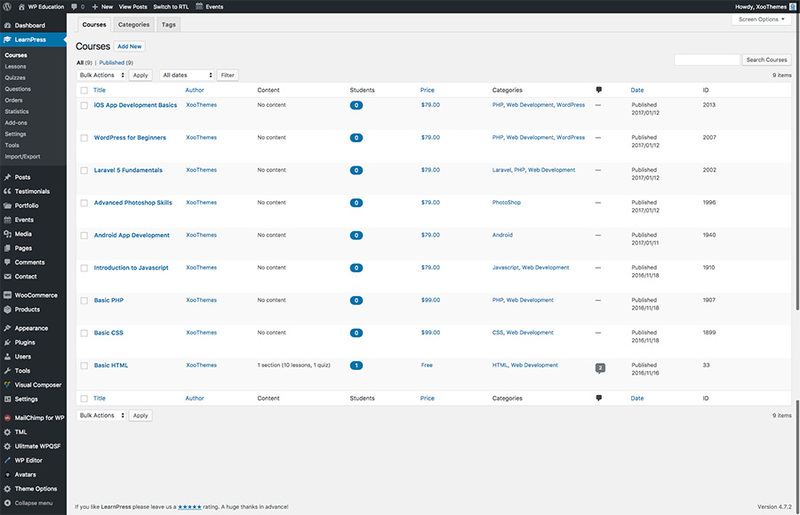 So, as an admin, you can easily run your business with WP Education theme that will make you some cash for sure. The theme contains the WooCommerce plugin. WooCommerce integration is one of the fantastic features you can have. You’ll be able to earn or let other people earn or buy the necessary courses and lessons through your site. The event calendar is an important part of this theme. You can arrange or rearrange any promotional event or meeting quite easily. As an admin or a site moderator, you can set an event calendar right from your website. Let the audience know about any specific event you are going to arrange. RTL or right-to-left system helps your site to detect RTL languages accordingly. RTL detection system can detect any language that actually supports RTL. So, you can use Arabic, Hebrew, and much more languages with ease. RTL is the reason your website will be able to detect the various type of languages. This education WordPress theme is a translation ready theme. It allows you to use multiple languages for different people around the world. If you target to create a worldwide audience panel then this can be very helpful. WP Education has included one of the most convenient Child theme. 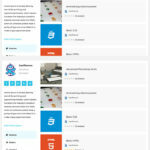 This education WordPress theme supports all the browser available. Cross browser compatibility allows anyone to use any theme in any browser as possible. So, these features is definitely user-friendly. This is the most crucial part of anything. If you face any problem without a theme just let us know. Our dedicated customer support team is always ready to solve your issues. No matter whatever the problem is and whenever you face it, you’ll get instant reply from our support team in no time. - Bootstrap 4.0 support added. - All the plugins are updated. 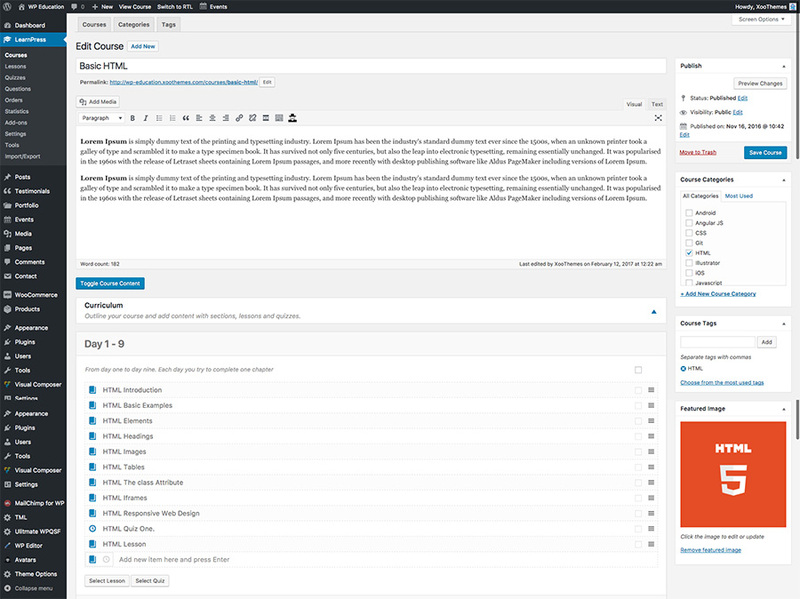 - LearnPress 3.0.9 support added. - All the plugins latest version support added. 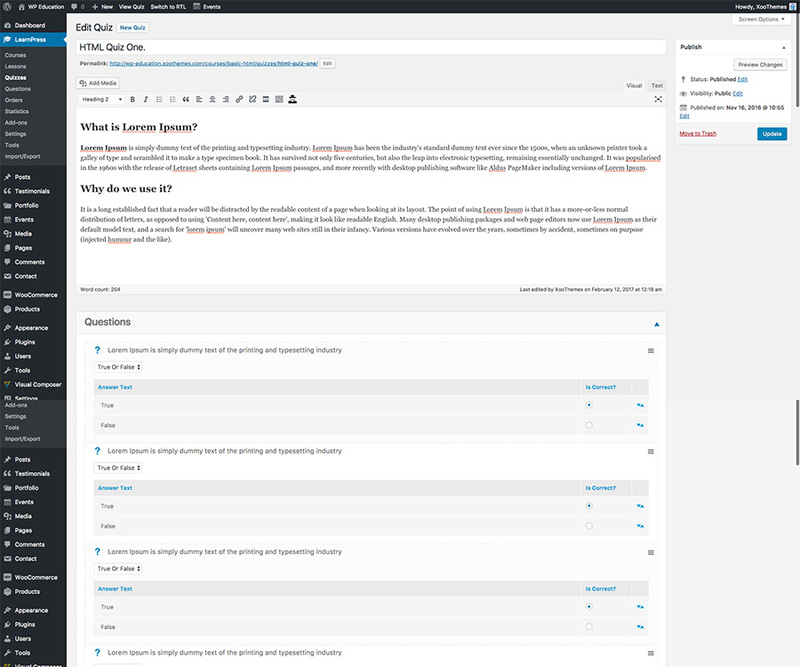 - LearnPress 3.0.2 support added. Latest Visual Composer Support Added. 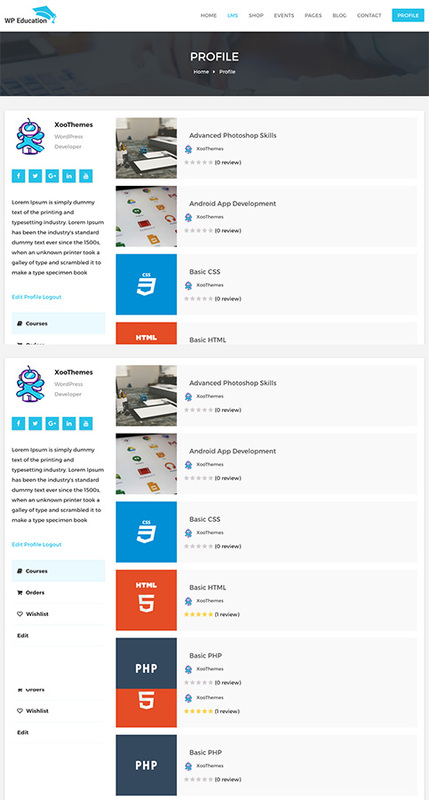 LearnPress premium addons support added.